Some 50 years after American Jim Wynne won the first UIM sanctioned World Drivers’ Championship in 1964 – the sport celebrates’ its anniversary-season with an historic first Grand Prix in the Peoples’ Republic of China. The bustling city port of Sanya on the southernmost point of Hainan Island, often referred to as the Chinese Riviera, will provide one of the most diverse and exciting backdrops of the year when it hosts the Sanya Grand Prix and the season-opener, 28-30 March. Defending World, Middle East and Edox Pole Position Champions Arif Al Zaffain and Mohammed Al Marri will lead the nine-strong fleet out as the Victory Team celebrates its own impressive landmark of competing at the top level in international powerboat racing. Twenty-one year’s after lifting their first World Championship in 1993, Victory Team’s title holders will be the pair to beat and will be looking to carry on where they left off in 2012 as they go in search of the team’s 13th World crown and adding to Victory’s remarkable tally of 93 wins from 168 starts. Al Zaffain and Al Marri have proved a powerful force since teaming-up at the end of 2011, winning eight times in 11 outings and qualifying in pole position five-times. This season Al Zaffain is chasing a sixth World title and Al Marri a fourth. Team Abu Dhabi head the list of challengers who face the daunting task of trying to unsettle and depose the Champions, and since entering the series in 2010 has become a growing force in the sport – albeit slightly overshadowed by their illustrious neighbours. Rashed Al Tayer and Majed Al Mansoori is an exciting partnership that has grown in stature since pairing for the first time in 2011 and their season-haul of six podiums last year saw them push the Champions all the way to eventually take the Championship runners-up slot and the team’s best overall finish. Chasing both the Middle East outfits will be Italy’s Fendi Racing with Luca Formilli Fendi and Giovanni Carpitella, a revitalised combination since switching out of their Outerlimits hull- engine package and into a Victory hull powered by SCAM V12s. LFFendi10 will roll-out in a new livery at the season-opener with the all-Italian pairing looking to build on their third overall in last year’s Championship standings. After switching hulls the duo produced an impressive run in the second half of 2012 picking up four podium seconds, one each in Gabon and Dubai and a double podium in Abu Dhabi and are genuine title challengers in 2013. The line-up in the second Fendi Racing boat, the Outerlimits hull, will see two newcomers joining the Championship ranks, with Italian Alfredo Amato teaming-up with Englishman, Miles Jennings. Following weeks of intensive pre-season preparation in Dubai, Zabo Racing’s team principal, Jan Zaborowski, is confident that the team will pick up in China where they left off in Abu Dhabi at the end of last season – on the podium – as they look to break the V12 dominance. The line-up inside Zabo-Isiklar remains the same with Turkey’s Ugur Isik and Norway’s Christian Zaborowski starting their third consecutive season as they look for their first win together. The duo will be hoping to build on last year’s fourth overall in the points table and will run the same Mercury 850 V8 engine package. A switch in line-up in Victory Australia sees Australia’s Ross Willaton step in for Peter McGrath to take the throttles and partner countryman Darren Nicholson. 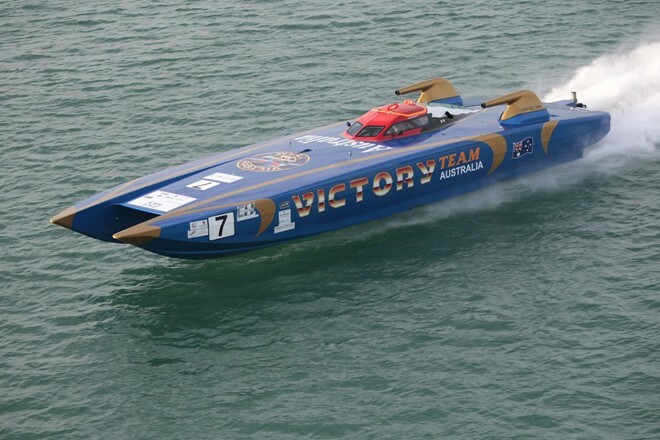 The Australian duo will run the same Victory hull powered by Victory V12 power-plants that Nicholson and McGrath acclimatised too quickly and made good use of in the final two races of 2012, with a podium apiece in Dubai and Abu Dhabi as well as a third quickest in qualifying in Abu Dhabi. Team D’Alessio-SCAM has confirmed the same line up with Gian Maria Gabbiani on the wheel alongside Luca Nicolini in the SCAM V12-powered FA.RO. ACCIAI. The all-Italian pairing joined forces last season at the Gabon Grand Prix, finishing in fifth place. Their Italian Grand Prix ended in dramatic fashion when they went over and out of the weekend at the first corner of race 1, but ran out the season with three top-six finishes in Dubai and Abu Dhabi to end up eighth in the Championship points table. Nicolini is a racing veteran with 25-years’ experience, getting his first Class 1 outing in 1993, dipping in and out of the series over the years and has 23 race starts under his belt. Gabbiani made his powerboat debut in 2010; he stepped-up to Class 1 last year to race alongside Guido Cappellini in Qatar, joining Team D’Alessio-SCAM in July. Teaming-up to race together for the first time and to run under the colours of Sanya and event organiser Visun Group are two of Norway’s most accomplished powerboat stars Marit Strømøy and Pål Virik Nilsen. Marit will swap the confines of her single-seater F1H2O circuit boat to take the wheel beside the experienced Pål Virik in the Maritimo-designed and built hull powered by Mercury V8 power-plants that she made her Class 1 debut in in Brazil in 2010. Born in Sandefjord, Norway and now living in Oslo, 36-year-old Strømøy made her racing debut in 1989 at the age of twelve, picking up numerous European and Nordic titles as she moved up through the smaller classes to make her debut and become the first woman to compete in F1H2O Championship in 2007. In 2011 she made racing history when she became the first woman in F1H2O to qualify in Pole Position. At 38, Pål Virik is an accomplished Class 1 veteran with 32 starts under his belt. He made his Class 1 debut in 2005 and in 2007 he switched roles from driver to throttleman to form an exciting partnership with Tom Barry-Cotter – the duo going on to win a hat-trick of titles in the Australian Offshore Superboat Championship (2008/9/10). He finished on the podium three times in Class 1 in 2009 and once in 2011. Last season he competed in Class 1 in Qatar and in the F2 World Championship, his win in Cagliari in Italy the highlight of a season cut short through injury. A surprise move by DAC Racing’s team principal and driver Guido Cappellini not to race sees the call-up of Italian Tomaso Polli to replace him in Poliform. The decision by Cappellini puts 37-year-old Polli back behind the wheel of a Class 1 for the first time since he raced alongside Luca Nicolini in Dubai in 2011, to partner Giampaolo Montavoci, one of the most experienced throttlemen on the tour with 101 Grand Prix starts under his belt and starting his sixteenth season in Class 1. The location of the newly constructed dry and wet pits puts the Class 1 boats into the heart of the hustle and bustle of the port to share the water with the fleets of traditional fishing and trading boats, and luxury super yachts moored opposite the imposing Visun Royal Yacht Club, which will give the anticipated tens-of-thousands of spectators a grand-stand view when they motor out along the Sanya River and past the man-made Phoenix Island to the 5.66Nm race circuit on Sanya Bay. The first official practice session is on Thursday (28) morning followed by qualifying in the Edox Pole Position at 14.30hrs (local). Two further practice sessions precede both races which start at 15.30hrs (local) on Friday, 29 and Saturday, 30.